Blaney once again led the Open teams, but this time wasn’t as visible on race day. He put up the 17th-fastest time in Friday’s opening practice and 19th in Happy Hour, but while fellow Ford drivers Ricky Stenhouse, Jr., Trevor Bayne, and Brian Scott made it into the Top Ten, Blaney could only anchor the second round. Blaney ran around the 15th spot for most of the day and kept his nose clean during the long green flag runs. However, on the final lap of the race, where a green-white-checkered decided it, Blaney found himself in the middle of the final wreck when he tangled with Aric Almirola, David Ragan, and Landon Cassill on the backstretch. Curiously, just two other Open teams joined Blaney on the Atlanta entry list, and both had missed the cut for the Daytona 500 in Duel Race #1. Premium Motorsports joined the 39-car entry list in a Chevrolet in place of Daytona’s Toyota and carried full sponsorship once more, this time from Tweaker Energy Shot and RaceTrac. Though mired back in 36th for the start of the race, Whitt put on a spirited charge to stay on the lead lap during the early laps. After the leaders started lapping cars on the 22nd go round, Whitt lifted his way to 30th by Lap 35. He then stayed out during the first green-flag pit sequence to lead Lap 42 - Premium’s first lap led since last July at Kentucky, when Reed Sorenson got a lap in the #62. However, after his first stop, Whitt began to fall back through the field and ended up one spot worse than where he started, 12 laps down. Wise finished last in Sunday’s race. For more, see his LASTCAR.info feature from Sunday. Five teams which attempted the Daytona 500 did not enter the Atlanta event. 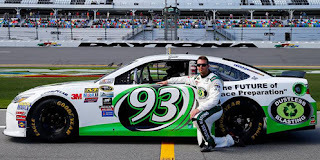 Two of them - the #59 fielded by Leavine and Circle Sport and the #93 of BK Racing - were temporary entries for regular drivers Michael McDowell and Matt DiBenedetto, who at Atlanta returned to their chartered #95 and #83 entries, respectively. While the missing #59 and #93 may not have been surprising, the other three were. Though Robert Richardson, Jr. has traditionally been a part-time competitor, his Daytona ride, BK Racing’s #26, ran full-time just a year ago with Jeb Burton and J.J. Yeley. One week after David Gilliland’s first Cup DNQ since Indianapolis in 2010, the benching of the #35, Front Row Motorsports’ own third team, meant Atlanta was the first Cup race Gilliland didn’t even attempt since the 2010 night race at Daytona. It was also the end of a streak for Hillman Racing, whose #40 had attempted every Cup race since their debut at Indianapolis in 2013 and hadn’t DNQ’d since the third race of 2014 at Las Vegas. A drop-off of entered teams from the Daytona 500 to the second round of the Sprint Cup schedule is not uncommon. Back in 2004, days before just 45 teams showed up to attempt the 43-car field for the Daytona 500, word spread that only 38 teams would appear for the next event at Rockingham. Through a number of behind-the-scenes deals, no less than seven part-time teams soon appeared to attempt the race, including such drivers as Andy Belmont and Joe Ruttman, who each hadn’t started a Cup race in nearly a decade, and such teams as Stan Hover’s #80, which hadn’t qualified for a Cup race since 1995. A couple teams pulled out before the race, but not before the field remained at 43, extending a streak of Cup events with full fields that didn’t end until the 42-car starting grid on June 28, 2014 at Kentucky. However, even with all three of the sport’s top divisions running the Atlanta track, there were no teams called out to fill out the field. 39 cars showed up, and 39 raced on Sunday. As the “West Coast Swing” begins next week in Las Vegas, the increased travel costs are expected by some to shrink fields further. Some reports expect events with just 37 starters - perhaps with the Wood Brothers as the only “open” team. Time will tell if this actually happens, and if so, for how long. Josh Wise picked up the 6th last-place finish of his NASCAR Sprint Cup Series career in Sunday’s Folds of Honor QuikTrip 500 at the Atlanta Motor Speedway when his #30 Key Realty Group Chevrolet finished under power, 18 laps down after 330 circuits. The finish was Wise’s first of the 2016 season and his first in Cup since last summer at Kentucky, 20 races ago. It came in Wise’s 129th series start. Wise enters his sixth Sprint Cup season driving for his seventh different team. The journeyman driver from Riverside, California has made steady progress through the years, going from a “start-and-park” driver for Front Row Motorsports in 2012 to a full-time competitor the next year, then moving to Phil Parsons Racing as it, too, ran full races for the first time in 2014, even achieving sudden headlines after an internet campaign earned him the Fan Vote in that year’s All-Star Race. With the Parsons team’s sale last year to Jay Robinson and Premium Motorsports, however, Wise left the team and over the offseason signed with The Motorsports Group (TMG). Like Wise, TMG has also fought to become competitive in NASCAR. 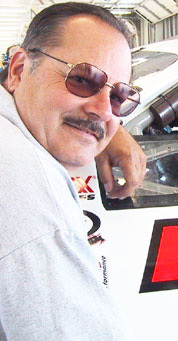 Team owner Curtis Key fielded cars in the XFINITY and Truck Series for more than two decades. The team earned their first top-five finish in just their fifth XFINITY start when Tommy Ellis came home 5th at Hickory on November 7, 1993. However, by 2011, sponsorship woes forced the team to begin to “start-and-park” on a near-weekly basis, its flagship #40 able to finish under power only a handful of times. Wise joined TMG the next season, and joined the game of musical chairs between the full-race #40 and the “start-and-park” backups, numbered #42, #46, and #47. Contrary to popular perception, the team’s drastic measures had a clear goal in mind: to move to the Sprint Cup Series. And so, after four difficult seasons, TMG made its move, suspending its XFINITY operation to focus on one single Sprint Cup car, #30, for 2015. Despite hiring current NASCAR Hall of Fame nominee Ron Hornaday, Jr., the learning curve proved steep. TMG’s fully-funded #30 Smokey Mountain Herbal Snuff Chevrolet was the slowest car in time trials and missed the 500 field. Hornaday made the next race at Atlanta when an inspection miscue marred qualifying, but the team made just one of its next 11 attempts - ironically with last-place record holder Jeff Green at Richmond. Key withdrew the car from the September race at Dover, locking the remaining 43 cars into the race, and instead prepared for Daytona. Wise was hired that offseason, and after another DNQ for the Daytona 500, the team came to Atlanta for a rebound. One week after a post-RTA Daytona 500 allowed for just 40 starters, the shortest Cup Series field since the final race at North Wilkesboro on September 29, 1996, Wise was one of just 39 entrants at Atlanta, the shortest field for a Cup race at the track since November 6, 1983, when Joe Booher’s #18 Booher Farms Buick trailed a 39-car field in the Atlanta Journal 500. While this locked The Motorsports Group into its second-straight Atlanta race, it also meant the #30 was now just one of three “open” teams at the track, down from eight at Daytona qualifying. Still, the team was in the race, and like in 2015, now eyes a run at attempting more races against even greater odds. Wise was slowest in the opening practice, improved to 37th in qualifying with a speed of 183.820 mph, and was 38th in Happy Hour. The 39th spot was to go to Jeffrey Earnhardt, making his first Cup start of the year in the chartered #32 Can-Am Ford. However, a technical infraction meant pole sitter Kyle Busch’s pole winning speed was disallowed after the session, meaning he would start last in Cup for the first time since August 24, 2013 at Bristol. When the green flag fell, however, Kyle quickly zipped past Wise in Turns 1 and 2, beginning a two-car race for 39th between Wise and Jeffrey Earnhardt that lasted the rest of the afternoon. Earnhardt’s #32 took 39th from Wise on Lap 3 and was the first to lose a circuit to the leaders on Lap 20. Wise took it back during green-flag pit stops on Lap 43, but Earnhardt took it again by the next round of stops around Lap 73. With the race still green and the entire field struggling to race on worn tires and last year’s low-downforce aero package, Wise took the last spot on Lap 105, and was 13 laps behind by the time the first caution fell on Lap 211. Earnhardt briefly took 39th one more time on Lap 238, but Wise took it a final time on Lap 246. In the end, Wise and Earnhardt remained just one lap apart in 39th and 38th. 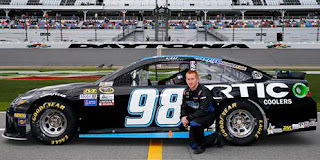 37th went to Cole Whitt, who like Wise rebounded from a Daytona DNQ and carried sponsorship from Tweaker Energy Shot and RaceTrac on his Premium Motorsports #98, now a Chevrolet from Toyota. Three laps ahead of Witt was Landon Cassill in Front Row Motorsports’ chartered #38 FR8 Auctions Ford. Rounding out the Top 5 was the #15 Aaron’s Chevrolet of Clint Bowyer, who continues to struggle in his first season with HScott Motorsports. *This was the first Cup Series last-place finish for the #30 since November 21, 1999, when Todd Bodine’s #30 Rudy’s Farm Pontiac for Bahari Racing started 5th, but crashed after 42 laps of the NAPA 500, also at the Atlanta track. *Wise completed the most laps of any Atlanta last-place finisher with 312 laps, besting Elliott Sadler’s March 9, 2008 record of 257 set during the Kobalt Tools 500 after his #19 Best Buy / Garmin Dodge was involved in three consecutive cautions. *Among points races, Wise finished the second-fewest laps down in Cup Series history, trailing only Jimmy Spencer, whose #23 Smokin’ Joe’s Ford finished 10 laps down in the Tyson Holly Farms 400 at North Wilkesboro on October 1, 1995. *Wise’s 312 laps complete ranks the eighth-most circuits completed by a last-place finisher in Cup Series history. The all-time record remains 401, set on April 18, 1999 when Ricky Craven’s #58 Hollywood Video Ford had handling issues during the Goody’s Body Pain 500 at Martinsville. +For purposes of clarity, these statistics do not include the 22 occasions where drivers were classified last by disqualification. 10 of those drivers, including 1949 inaugural event qualifier Glenn Dunaway, were originally flagged the winner and are still credited with completing all the laps in the official results. No Cup driver has been classified last by a post-race disqualification since October 11, 1992, when Bobby Hillin, Jr.’s #31 Team Ireland Chevrolet was displaced from 15th following the Mello-Yello 500 at Charlotte. Jeff Green picked up the 84th last-place finish of his NASCAR XFINITY Series career in Saturday’s Heads Up Georgia 250 at the Atlanta Motor Speedway when his unsponsored #10 TriStar Motorsports Toyota fell out with electrical issues after he completed 1 of the race’s 163 laps. The finish was Green’s first of the season, his first since last year’s Homestead finale, two races ago, and came in his 422nd series start. It also marked Toyota’s 250th last-place finish across NASCAR’s top three divisions. 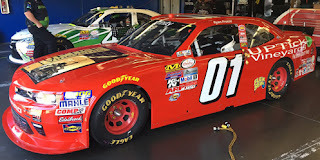 Following a one-race stint for Rick Ware Racing in the Daytona opener, Green again returned to TriStar Motorsports to run the team’s “start-and-park” #10. 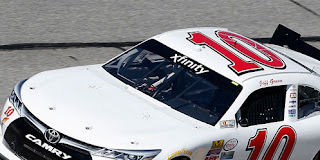 Also joining the Mark Smith-owned team in a third car was J.J. Yeley, who after losing his ride with JGL Racing in XFINITY and BK Racing in Cup made his 2016 debut at Atlanta with a sparkling 19th-place finish in an identical unsponsored #14 Toyota. While the Sprint Cup field remained at 39 from the posting of the preliminary entry list through the race itself, the first list for the XFINITY race grew from 37 at the start to 41 by Thursday with the late additions of Rick Ware Racing’s #15 and #25, the Jimmy Means Racing #52, and Obaika Racing’s #97. Following Friday’s withdrawal of Rod Sieg’s second entry, the #93 to be driven by Scott Lagasse, Jr., Green and the 40 remaining entrants were guaranteed starting spots in the race. Green didn’t participate in Friday’s first practice session, was the lone holdout in the second, and was slowest overall after a four-lap shakedown run in Happy Hour. Regardless, he qualified the white #10 on speed in 31st position with a single lap of 175.083 mph. Starting 40th on Saturday was Chris Cockrum, who did not complete a qualifying lap in the #25 Advanced Communications Group Chevrolet fielded by Rick Ware and was kept in the back for unapproved adjustments. Well after Green pulled the #10 behind the wall after Lap 1, securing the last-place finish, Cockrum continued to struggle, spinning on Lap 16 after a flat tire. Still, he managed to finish 29th at race’s end - the best finish among the four late entries added on Thursday. Finishing 39th on Saturday was David Starr, Green’s other TriStar teammate, after his #44 Zachry Toyota lost an engine down the backstretch on Lap 9. Todd Peck came home 38th in his second career XFINITY Series start and third for Truck Series owner B.J. McLeod after the #99 Bateries Plus Bulbs Ford also left with engine woes. 37th went to Morgan Shepherd, who joins Green as the only two drivers to finish inside the Bottom Five in the first two races. Rounding out the group was Carl Long, out with handling woes in his unsponsored #40 Toyota, but in the show with Motorsports Business Management teammate / owner Derek White in the #13 after both were blanked in Daytona qualifying. *This is the first last-place finish for the #10 in an XFINITY Series race since May 2, 2015 at Talladega, when Charles Lewandoski’s turn in the unsponsored TriStar machine during the Winn-Dixie 300 at Talladega ended after 3 laps with transmission issues. *This is the first last-place finish for the #10 in an XFINITY Series race at Atlanta since August 30, 2014, when Green’s #10 Heroes Behind the Camo SupportMilitary.org Toyota had a vibration 3 laps into the Great Clips 300 to benefit Feed The Children. 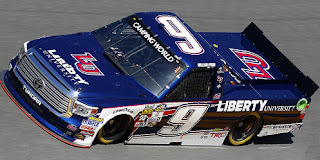 William Byron picked up the 1st last-place finish of his NASCAR Camping World Truck Series career in Saturday’s Great Clips 200 at the Atlanta Motor Speedway when his #9 Liberty University Toyota lost an engine after he completed 59 of the race’s 130 laps. The finish came in Byron’s 3rd series start. The defending K&N Pro Series East Champion - and Rookie of the Year - clinched his title at just 17 years of age with his fourth victory of the season in the October finale at Dover. It capped an impressive year for the Charlotte, North Carolina native who got his start playing the iRacing simulator. That same season, he scored a CARS Super Late Model victory at Hickory, finished runner-up in both his ARCA debut at Lucas Oil Raceway and in the Denny Hamlin Short Track Showdown at South Boston - and signed a deal with Kyle Busch Motorsports to run full-time in the Truck Series. Byron made his series debut last fall at Phoenix, where he started 5th but was caught in an early crash with Brandon Jones and Cole Custer, leaving him 31st. He returned this season to Daytona where he this time dodged nearly all the wrecks - before his #9 was damaged in the last-lap fracas involving teammate Christopher Bell. Regardless, Byron now had a 13th-place finish in his back pocket heading into his Atlanta debut. 37 trucks showed up to contest the 32 starting spots in Saturday’s field, and among them Byron again qualified 5th with a speed of 136.436 mph. He was also 6th in the opening practice session on Friday, 3rd in the second, and 8th in Happy Hour. Among the five drivers who missed the race were Norm Benning - his second in a row to start the season - as well as popular upstarts Jordan Anderson and Ryan Ellis. Starting 32nd on Saturday was Jennifer Jo Cobb, who despite being one of three drivers to not complete a qualifying lap was locked into the field on owner points, bouncing back from a DNQ at Daytona. Cobb’s #10 Driven2Honor.org / Westside Vapor Station Chevrolet, which carried the names of several fan supporters on the rear bed, was joined by J.J. Yeley’s #07 Engine PArts Plus Chevrolet and Daytona winner Johnny Sauter in the #21 Allegiant Travel “Back in a Bowtie” Chevrolet, which were sent to the back for the driver missing introductions and pitting before green, respectively. While Yeley, Sauter, Cobb, and several other drivers lost laps in the early going, it wasn’t until Lap 61 that Byron entered the last-place picture. His #9 erupted in smoke coming off Turn 4, signaling the engine failure that ended his day. Finishing 31st was another KBM truck, this time the #51 ARRIS Toyota of Daniel Suarez. Suarez was racing Matt Crafton for the lead off Turn 2 when contact from Christopher Bell in yet another KBM truck turned him into Crafton, triggering a hard wreck that eliminated both Suarez and Crafton. Bell continued on before losing a right-front tire while leading with just 7 laps to go, wrecking him out of the race and handing the win to John Hunter Nemechek. The crash left Bell just outside the Bottom Five, separated by Cobb’s lapped #10 and Sauter’s #21. In all, the three KBM trucks finished 26th, 31st, and 32nd. *This marks the first last-place finish for the #9 in a Truck Series race since October 18, 2008, when Sean Caisse’s #9 Germain.com / Lumber Liquidators Toyota crashed after 44 laps of the Kroger 200 at Martinsville. *This is the first last-place finish for Kyle Busch Motorsports in a Truck Series race since February 24, 2012, when the late Jason Leffler wrecked 17 laps into the season-opening NextEra Energy Resources 250 at Daytona. On Sunday, March 15, 1992, Bob Schacht picked up the 3rd last-place finish of his NASCAR Winston Cup career in the Motorcraft Quality Parts 500 at the Atlanta Motor Speedway when his #13 Shoney’s Chevrolet dropped a valve after he completed 23 of the race’s 328 laps. The finish was Schacht’s second of the season and came in his 11th series start. Schacht, a 42-year-old driver from Lombard, Illinois, was entering his sixth season in Cup Series competition. His career began on August 16, 1981 when he finished 32nd in his family-owned #97 Test Tube Oldsmobile in the Champion Spark Plug 400 at Michigan, a race won by Richard Petty. Following a lone Busch Series (now XFINITY Series) start at Milwaukee in 1984, Schacht split his time between the ARCA Racing Series and Cup, racing at a time where drivers who missed the field for Cup races typically filled out ARCA fields. He scored the first four of his ten career ARCA wins during his first three seasons from 1985 through 1987, then was a journeyman between several single-car Cup teams during east coast races. 1992 marked Schacht’s first start in the Daytona 500 in his first-ever attempt. Driving for Earl and Chek Sadler (Sadler Brothers Racing) in the #95 Shoney’s Oldsmobile, Schacht made the race on speed, earning the 9th starting spot in Race 2 of the Twin 125s before finishing 28th. The engine woes that ended his run in the 125s carried over to the 500, however, and he ended up finishing last after just 7 laps. Atlanta would be Schacht and the Sadler Brothers’ next attempt, but in qualifying the #95 ended up the fastest of four cars to miss the race. The Sadlers then purchased a starting spot from fellow single-car team owner Clint Folsom, whose #13 Chevrolet was set to start 33rd with Alabama short-tracker Dave Mader III. This allowed Schact to start Sunday’s race in Folsom’s #13, which now carried the Sadler’s sponsorship from Shoney’s. Despite the driver change, it would be Folsom’s first Cup start as a team owner after running in the Busch Series and ARCA Racing Series in 1991. The driver change forced Schacht to start at the rear of the field for the start of the race, placing him behind last-place starter Jimmy Means. Means, the longtime owner-driver and current team owner of Joey Gase’s XFINITY Series ride, earned the final provisional in a white #52 Axe Equipment Pontiac with the 1988-1990 sheet metal he would run for much of the season. As the green flag flew, Schacht and Means lagged behind the rest of the field, followed seconds later by another car - the #4 Kodak Film Chevrolet of Ernie Irvan. Irvan broke a collarbone in a hard crash early in the Busch Series race the day before and was released from the hospital just two hours before the command to start engines. With one lap in the books, Irvan pulled down pit road and gave up his seat to then-defending Busch champion Bobby Labonte, who at the time had made just three Cup starts. Labonte lost at least two laps during the driver change and promptly took last from Schacht and Means. The race was still under green when Schacht made an unscheduled stop after 23 laps with a dropped valve. The caution flew 17 laps later for defending race winner Ken Schrader, whose #25 Kodiak Chevrolet fielded by Hendrick Motorsports lost a right-rear tire and made contact with the outside wall in Turn 3. The race-ending damage to Schrader’s car heightened concerns about Goodyear’s new radial tires, which were being run at the Atlanta track for the first time. Two of the race’s seven cautions were competition cautions to allow teams to check tire wear. The remaining three spots in the Bottom Five all belonged to owner-drivers. 40th went to Texas driver Eddie Bierschwale, who was making the 114th of his 117 career Cup starts in his #23 SplitFire / Auto Finders Oldsmobile before he also dropped a valve. Darrell Waltrip came home 39th when his #17 Western Auto Chevrolet lost ground to the leaders, then made an unscheduled stop on Lap 79 with a loss of oil pressure. Rounding out the group was Means, who went down a circuit on Lap 17 and then lost the engine after 87 laps. Schacht hasn’t raced in Cup since his sixth and final Cup last-place finish at Pocono in 1994, but he’s remained an active car owner an infrequent competitor in stock car racing. It was Schacht who gave Stuart Kirby his Cup debut at Charlotte in 2001, fielded plate-track cars for fellow ARCA veteran Bobby Gerhart was recently as 2010, and just last year in the ARCA road course race at New Jersey Motorsports Park, Schacht finished 11th in his 150th series start at the age of 65. *This was the first last-place finish for the #13 in a Winston Cup race since July 21, 1991, when Gary Balough’s #13 Linro Motorsports Buick tangled with Irv Hoerr’s #44 High Point Bedding Oldsmobile after he completed 2 laps of the Miller Genuine Draft 500 at Pocono. Balough’s car was fielded by Linro Motorsports, owned by Jim Rosenlum, who currently fields the #28 FDNY Racing entry in the Truck Series. McDowell turned in the fastest speed in Wednesday’s first practice session and did exactly what he needed to do in Can-Am Duel Race #1 on Thursday, finishing 14th and securing the 39th spot in Sunday’s field. It marked the first Cup points race for the #59 since 2004, when Klaus Graf qualified for BAM Racing at Sonoma, and the first time in the Daytona 500 since 1982 with short-tracker Tighe Scott. In the race itself, McDowell briefly held 40th on Lap 2 before more or less remaining third among the Open teams for much of the race. He then climbed to second among the group after Matt DiBenedetto crashed just before the halfway point. During the race’s second half, he lost a lap to the leaders and had a brief exchange with Ricky Stenhouse, Jr. on pit road, then raced into the Lucky Dog spot when Danica Patrick’s wreck drew the yellow with 16 laps to go. McDowell managed to hold off Ryan Blaney in the run to the checkers for his best finish since a career-best 7th at Daytona in July 2014, ten spots ahead of Ty Dillon in Leavine’s chartered #95. Blaney’s fleet Wood Brothers Ford nearly pulled off a win in Can-Am Duel Race #1 on Thursday, finishing 3rd behind winner Dale Earnhardt, Jr. and Joey Logano. In the 500 itself, he seemed to pick up right where he left off, remaining in or near the Top 10 for mos of the race’s first half. When the Toyotas formed up at the head of the pack near the end of the race, however, Blaney struggled with the rest of the field to catch them and remained mired in the middle of the pack. He came home a somewhat disappointing 19th at the finish, four cars behind McDowell, but like his Penske teammates, the engine held together for the entire 500 miles. Richardson’s Toyota was sluggish during Can-Am Duel Race #2, and both he and Hillman Racing’s Reed Sorenson fell back so far that they lost a lap to the leaders with six laps to go. Whatever handling or power issues plagued him carried over into Sunday, where he fell nearly ten seconds behind the field during the first 20 laps. Richardson never climbed out of the final ten spots in the field, and in each run seemed to lose a second to the leaders. A likely cause for this may have been his car’s ailing motor, which finally dropped a valve after he ran 135 laps, ending his race. DiBenedetto finished last in the Daytona 500 when a crash ended his run after 91 laps. For more details, see yesterday’s LASTCAR.info feature. For the first part of the SpeedWeeks, The Motorsports Group was making steady gains. Josh Wise was 43rd-fastest in the opening session and 42nd in the second, but improved in the draft to 25th in the third session and 20th in the fourth. Despite starting Duel Race 1 in the 21st position, he never once trailed the field and instead managed to work his way into contention. On Lap 48, following the caution for Cole Whitt’s spin, Wise restarted 13th ahead of Michael McDowell’s practically locked-in #59 Chevrolet. Two laps later, however, Wise slipped to 18th and appeared to be fighting a loose condition, at one point late in the race nearly spinning off Turn 4 before gathering it up. By the final lap, however, the white #30 had fallen to the tail end of the lead pack, leaving him 17th and leaving both drive and team out of their second-straight 500 field. Front Row Motorsports’ three entries were ranked in the middle-to-lower end of the speed charts in qualifying, which didn’t bode well for Gilliland’s chances of racing his way into the field. The white #35 started out just 41st in the opening practice, 38th in the second, then jumped to 19th in the draft on Wednesday afternoon. Unfortunately, just an hour later, both he and teammate Chris Buescher were involved in the multi-car tangle off Turn 4, causing damage to both ends of their cars. The crew worked hard up until the day of the race, and Gilliland’s car was set to roll off in Duel Race 2. Once again, both Gilliland and this time teammate Landon Cassill continued to struggle for speed with Cassill trailing the field for most of the race’s first half. Gilliland, meanwhile, locked bumpers with Robert Richardson, Jr.’s #26 BK Racing entry and by Lap 19 were by themselves in 17th and 18th. On Lap 26, Gilliland and Richardson were caught by a trailing four-car pack, then both lost even more ground during green-flag pit stops. When 3rd-place Jimmie Johnson triggered a multi-car wreck on the final lap, Gilliland but not Richardson was placed ahead of the four drivers involved as well as Casey Mears, who ran out of fuel while in 2nd. Although this put Gilliland six spots ahead of Richardson, it was academic in the final rundown - Richardson edged him for the final starting spot by three-tenths of a second in qualifying. Sorenson avoided serious involvement in Wednesday’s practice crash, but the Hillman Racing team was unable to capitalize. The #40 was slowest in the opening practice session - 44th overall - and second-slowest to Wise in the next. Drafting only lifted Sorenson to the 30th spot in Wednesday’s first session, keeping him behind all other open teams, and he didn’t complete a lap after the near-miss that afternoon. Sorenson was not at all the slowest car in the Duels themselves - he only briefly held the last spot on Lap 7 - but the long green-flag runs kept him in the final pack well out of contention. With six laps to go, Sorenson and Robert Richardson, Jr. lost a lap to the leaders, and an apparent late-race unscheduled stop cost him another three before the finish. Whitt finished last in Duel Race 1 after an early spin and missed the 500 field as a result. For more, see his LASTCAR.info feature from last Thursday. Matt DiBenedetto picked up the 1st last-place finish of his NASCAR Sprint Cup Series career in Sunday’s 58th Annual Daytona 500 at the Daytona International Speedway after his #93 Dustless Blasting Toyota was involved in a multi-car wreck after he completed 91 of 200 laps. The finish came in DiBenedetto’s 34th series start. Seven years ago, the Grass Valley, California native made his XFINITY Series debut at Memphis, where he came home 14th as a development driver for Joe Gibbs Racing. Two years ago, he was start-and-parking for The Motorsports Group on a nearly full-time basis, but still broke through with an 11th-place finish at Road America. Last year, he made his Sprint Cup debut at Phoenix driving for BK Racing, then soon after finished a career-best 18th at Talladega. And when time trials were over last Sunday, Matt DiBenedetto had locked himself into his first Daytona 500 field with a qualifying lap of 192.686 mph, good enough for 24th-best of 44 entrants. In the aftermath of the Race Team Alliance’s arrangement over the offseason, just 40 cars rolled to the starting line for Sunday’s race. This made the 500 the shortest Cup Series field since September 29, 1996, when 37 cars lined up for the Tyson Holly Farms 400, the final Cup event at North Wilkesboro Speedway. Stating in that 40th spot was Robert Richardson, Jr., called away from farming on a Texas ranch to run as one of DiBenedetto’s teammates in the #26 Stalk It Toyota. Joining Richardson in the rear were five backup cars sent there due to crashes in the Duels: Matt Kenseth, Brian Scott, A.J. Allmendinger, Jimmie Johnson, and Martin Truex, Jr.
At the end of Lap 1, Scott’s #44 Albertsons / Shore Lodge / Ritz Triscuit Ford had fallen to 40th, trailing a group of five cars that were already lagging behind the leaders. Next on Lap 2 was Michael McDowell, in his open #59 Thrivent Financial / K-LOVE Chevrolet. On Lap 4, Austin Dillon was struggling with the handling on his #3 Dow Chevrolet, putting him 40th for a moment before Richardson fell behind him on Lap 5. Richardson and Dillon lost touch with the pack during the opening twenty circuits: at one point, Richardson was 8 seconds behind the field. This gap went away completely when the first caution flew on Lap 20. 20-year-old Chase Elliott made headlines when he won the pole for the Daytona 500 in Jeff Gordon’s iconic #24, now sponsored by NAPA Auto Parts. He was still among the leaders on Lap 20 when his car suddenly hooked left off Turn 4, causing him to cross the nose of Carl Edwards’ #19 ARRIS Toyota. Elliott kept his car off the inside wall, but wound up in the grass, where the splitter was ripped from his machine. Dropped to last as the entire field went by, Elliott was stuck behind the wall for nearly a quarter of the race as the Hendrick Motorsports crew attached a new nose to the #24. Had Elliott finished last on Sunday, it would have been the first last-place finish for the #24 in Sprint Cup since April 6, 2008, when Jeff Gordon’s DuPont Chevrolet crashed 124 laps into the Samsung 500 at Texas. It would also have been the first last-place run for the number in a Cup points race at Daytona since July 1, 1989, when Johnny McFadden’s Alliance Training Centers Pontiac crashed on the first lap of the Pepsi 400. And it would have been the first last-place run for the #24 in the Daytona 500 since February 22, 1970, when Cecil Gordon’s unspsonsored 1968 Ford followed Richard Petty’s Plymouth Superbird to the garage area with a busted a-frame after 7 laps. Instead, Elliott returned to the track on Lap 58, 40 laps down. Meanwhile, DiBenedetto was fighting to stay with the lead pack. His #93 had run around 20th for most of the early stages, but near the halfway point was beginning to fade toward the rear of the field. Then, on Lap 93, his car broke loose entering Turn 1 and collided with the #34 Love’s Travel Stops Ford of rookie Chris Buescher, sending both cars hard into the outside wall. Both drivers walked away uninjured, but both cars were unable to continue. Elliott managed to not lose another lap for the rest of the afternoon and passed both DiBenedetto and Buescher on Lap 132. A few laps later, Elliott also passed Richardson, whose #26 went behind the wall with a broken valve. The #24 came just ten laps short of passing pre-race favorite Dale Earnhardt, Jr., whose #88 Nationwide Chevrolet spun in nearly the same spot as Elliott before hitting the inside wall. *This marks the first time that both the #93 and BK Racing have ever finished last in the Daytona 500. *This is the first last-place finish for the #93 in a Sprint Cup points race since October 26, 2014, when Clay Rogers’ own BK Racing entry, the Burger King / Dr. Pepper Toyota, overheated after 25 laps of the Goody’s Headache Relief Shot 500 at Martinsville. Ryan Preece picked up the 1st last-place finish of his NASCAR XFINITY Series career in Saturday’s Powershares QQQ 300 at the Daytona International Speedway when his #01 Uptick Vineyards Chevrolet was involved in a multi-car crash after he completed 5 of 120 laps. The finish came in Preece’s 4th series start. Preece, a 25-year-old standout from the NASCAR Whelen Modified Tour, has won at least two modified races a season since 2012 in addition to the 2013 series championship. That same year, he made his XFINITY Series debut with team owner and fervent modified supporter Tommy Baldwin, Jr., finishing 24th in that first race at Loudon. Just last year, Baldwin coordinated with Premium Motorsports to give the youngster his first try at Sprint Cup, again at Loudon, where he came home 32nd in the #98 Mohawk Northeast / East West Marine Chevrolet. After returning to Premium to run the final four races of the season, Preece was hired by Johnny Davis to drive his flagship #01 Chevrolet for the full XFINITY Series season in 2016. 48 cars showed up to make the 40-car field for Saturday’s race, and Preece looked to make an impression in his first superspeedway start. He ran 34th in the opening practice, then leapt to 4th in the second session behind David Starr, Brandon Jones, and veteran Joe Nemechek. He didn’t participate in Happy Hour and instead turned his sights to qualifying, where he timed in 31st with a speed of 177.322 mph. Among the eight DNQs were 1990 Daytona 500 champion Derrike Cope and Mike Harmon, whose Truck also missed the race the night before. Starting 40th in the field was all-time last-place leader and five-time and defending LASTCAR XFINITY Series Champion Jeff Green. Green was making his first XFINITY Series start for a team other than TriStar Motorsports since he ran a one-off for ML Motorsports at Daytona in 2013. This time, he would be driving the #17 Dashub.com Chevrolet for Rick Ware - ironically the same team with which Ryan Ellis finished 40th last September at Darlington to end Green’s record streak of eight last-place runs in a row. Coming into the Daytona race, Green had finished last in the final six rounds of the 2016 season and had a chance to extend his record once more. By the end of Lap 1, however, Green had moved all the way up to 29th, dropping Joey Gase and his Jimmy Means-owned #52 JT Concrete / TransLife Chevrolet to the last spot. Gase held the spot until Lap 5, when the caution flew for the first time for a wreck in Turns 1 and 2. FOX Sports 1 only caught the tail end of the wreck, but it was clear that Preece’s #01 had made contact with the #85 Lucas Oil Chevrolet of ARCA veteran Bobby Gerhart, causing severe right side damage to both vehicles. Also involved was the #46 of Belgian driver Anthony Kumpen, whose EL Systems / Nexteer Automotive / LeasePlan Chevrolet made it to pit road along with Gerhart. Preece, however, had to climb out and let his car be towed behind the wall, leaving the #01 and #85 in the final two spots. Finishing 38th that afternon was Canada’s Martin Roy in the #90 Gamache Truck Center / Cote Chevrolet. Roy’s team owner Mario Gosselin failed to make the field in his #92 and Roy fell out on Lap 23 when he clipped the apron in Turn 1 and smacked the wall. Despite his early strong run, Green ended up 37th at the finish, citing transmission issues. Morgan Shepherd, celebrating his 49th year in NASCAR, rounded out the Bottom Five when his #89 Racing With Jesus / Courtney Construction Chevrolet broke a rear gear. *This is the first last-place finish for the #01 in an XFINITY Series race since August 10, 2013, when Mike Wallace’s unsponsored #01 JD Motorsports Chevrolet wrecked on the opening lap of the Zippo 200 at Watkins Glen International. *This is the first last-place finish for JD Motorsports since November 8, 2014, when Jeffrey Earnhardt’s unsponsored #4 JD Motorsports Chevroelt lost an engine without completing a lap of the DAV 200 Honoring America’s Veterans 200 at the Phoenix International Raceway. Tommy Joe Martins picked up the 1st last-place finish of his NASCAR Camping World Truck Series career in Friday’s NextEra Energy Resources 250 at the Daytona International Speedway when his #44 Diamond Guest Jeans Chevrolet was involved in a pair of single-truck crashes after he completed 11 of the race’s 100 laps. The finish came in Martins’ 6th series start. Martins, a 29-year-old owner-driver from Como, Mississippi, made his NASCAR debut in 2009, finishing 22nd in the Truck Series race at Lucas Oil Raceway in Indianapolis. The next year, he made his superspeedway debut with the ARCA Racing Series at Daytona, and finished a sterling 8th. In 2014, Martins and team moved to the XFINITY Series, where he made 11 of his 17 attempts in mostly-unsponsored Fords and Doges. His season-best again came on the plate tracks, this time a 14th at Talladega in his Dodge. However, after eight DNFs and continued sponsorship woes, Martins and team left the series at midseason. Friday’s Daytona race marked Martins’ first NASCAR attempt since his DNQ for the 2014 XFINITY Series race at Indianapolis. 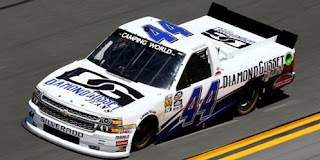 He would run truck #44, the same number he ran in his series debut seven years ago, and carried sponsorship from Diamond Gusset Jeans, which ran on his successful XFINITY effort at Talladega. This time, he would also have technical support from Gallagher Motorsports, whose trucks started on the front row. Martins ran 17th and 21st-fasted in the weekend’s two practice sessions, but was still one of 43 entries going for 32 spots in a very competitive field. He struggled in qualifying, needing to rely on a provisional to start 28th with a speed of 173.685 mph, but most importantly was in the show. Among the 11 DNQs were eight Chevrolets as well as series regulars Norm Benning, Jennifer Jo Cobb, Ryan Ellis, and Mike Harmon. 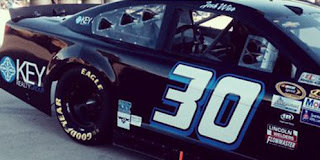 Starting 32nd on Friday was Travis Kvapil, whose unsponsored MAKE Motorsports #50 made the show with the Past Champion’s Provisional. Kvapil moved out of last on Lap 3 en route to a fifth-place finish, his first in the series since 2012, putting Frenchman Michel Disdier’s #07 Pray For Paris Chevrolet to the final spot. Meanwhile, the next time by, Martins had worked his way toward the Top 20 when the right-front tire went down, sending him hard into the outside wall in Turn 4, drawing the first caution of the night. Martins’ crew got the #44 fixed quick enough to stay on the lead lap, and the race went green again on Lap 10. In seconds, Martins had moved past Tyler Young’s #02 Randco / Young’s Building Systems Chevrolet to put Young in last. Just one lap later, in the exact same spot as before, the right-front failed Martins again, and he this time hit the wall hard enough to knock him out of the race. Finishing 31st on Friday was Cody Coughlin, whose #18 Jegs / Spillfix Toyota wrecked with Spencer Gallagher’s #23 Allegiant Travel Chevrolet when several leaders tried to duck onto pit road before the 20-minute Caution Clock expired. 30th went to Jordan Anderson, whose brand-new #66 Columbia SC - Famously Hot Chevrolet broke a rear gear and stopped on the track on Lap 78. Rounding out the Bottom Five were Rico Abreu and Daniel Suarez, whose Toyotas were among the 18 drivers involved in a grinding Turn 3 wreck with six laps to go. *This is the first last-place finish for the #44 in a Truck Series race since February 21, 2009, when local driver Lance Hooper left the San Bernardino County 200 after 2 laps when his unsponsored #44 Key Motorsports Chevrolet picked up a vibration. 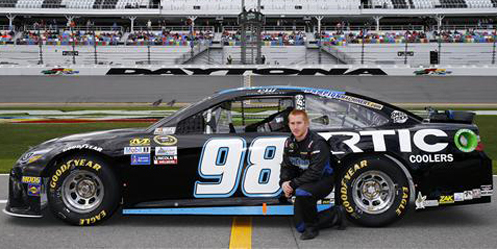 Cole Whitt finished last in Thursday night’s running of Can-Am Duel Race 1 at the Daytona International Speedway when his #98 RTIC Coolers Toyota was involved in a single-car accident that ended his race after 47 fo the race’s 60 laps. Released from Front Row Motorsports at the end of last season, Whitt signed with Premium Motorsports on February 2. 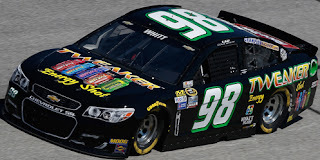 The #98 switched from Phil Parsons Racing’s Fords and Premium’s former Tommy Baldwin Racing Chevrolets to Toyota for 2016 and on February 13 announced sponsorship from icebox company RTIC Coolers. One day earlier, Premium leased its charter medallion inherited from the Parsons merger to HScott Motorsports, meaning Whitt would have to make the field on speed or else race his way in. Whitt was 40th and 37th in the opening two practices and remained 37th in time trials with a speed of 190.375 mph, ranking him fifth among the non-chartered “open” teams. He was just three-hundredths of a second of besting Robert Richardson, Jr., whose BK Racing #26 Stalk It Toyota was the second of two cars who were not quite locked-in, but could fall back on their qualifying time. Whitt and the three “open” cars behind him had no such safety net, meaning their only chance of making the 500 was to race their way in on Thursday. Just 36 cars practiced on Wednesday morning, but Whitt pulled to 12th-fastest overall, second among the “open” teams behind overall leader Michael McDowell. He didn’t complete a lap in the two sessions that followed and instead set his sights on Duel Race 1, where he would roll out 19th. Starting 22nd in Duel Race 1 was last year’s second-place points man Kevin Harvick, who along with teammate Brian Vickers had their qualifying times disallowed for a track bar infraction. He was joined at the back by Roush-Fenway Racing teammates Trevor Bayne, Greg Biffle, and Ricky Stenhouse, Jr., who all changed rear gears prior to the race. By the time the field entered Turn 1, Harvick had passed three cars, dropping Bayne’s #6 AdvoCare Ford to last. On Lap 5, Bobby Labonte #32 Can-Am fell to last, joining the Roush-Fenway trio that was rapidly losing ground to the leaders. By Lap 12, Labonte had fallen four seconds behind the next car in line and ten second back on Lap 18. Labonte held the spot until Lap 30, when Ryan Blaney’s fleet #21 Motorcraft / Quick Lane Tire & Auto Center Ford pitted by himself and lost a lap to the leaders. Whitt, meanwhile, had been dogging McDowell for a transfer spot and tried some strategy after his own stop on Lap 41. While McDowell beat Whitt off pit road, the #98 lay back to catch the drafting help of a line of cars, including Regan Smith’s #7 Golden Corral / Nikko Chevrolet for Tommy Baldwin Racing. The plan seemed to work as Whitt caught McDowell within a lap and in Turn 1 looked set to make a move around McDowell’s #59. However, as he switched lanes, Smith made contact with Whitt’s rear bumper, sending the #98 spinning to the apron for the first caution of the night. Whitt had fallen to last by Lap 48 as the crew made repairs and sent him back on track. On the restart, the #98 struggled to keep pace with the leaders and dove back down pit road the next time by, ending his night. Without enough speed to make the field, he became the first driver to miss Sunday’s race. The only other two retirees were Paul Menard, who had a tire issue, and Brian Scott, who tangled off the final corner racing near the back of the lead pack. Scott’s #44 Albertsons Co. / Shore Lodge Ford was fastest in Wednesday’s second practice session, but was totaled when he slammed the inside wall near the entrance to pit road. Rounding out the Bottom Five were Labonte, the final car on the lead lap, and Clint Bowyer - his second-straight bottom-five finish in Daytona’s preliminaries. *This was Whitt’s first last-place finish in the Duels, but the second in a row for the #98 team. Last year, when the #98 was owned by Phil Parsons, Josh Wise was unable to start Duel Race 2 when his Phoenix Construction Ford had electrical issues on pit road. 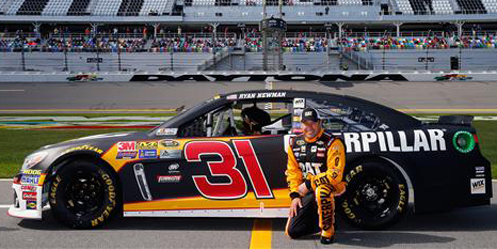 Ryan Newman finished last in Thursday night’s running of Can-Am Duel Race 2 at the Daytona International Speedway when his #31 Caterpillar Chevrolet lost an engine after he completed 31 of the race’s 60 laps. Newman enters his 17th Sprint Cup season and third with Richard Childress Racing. The 2008 Daytona 500 winner comes off his third-straight Chase appearance, but is also looking for his first Cup win in the Caterpillar colors. With the exception of sponsor Quicken Loans moving to Hendrick Motorsports, the team has remained largely the same since last season and has come to Daytona looking to make a statement. 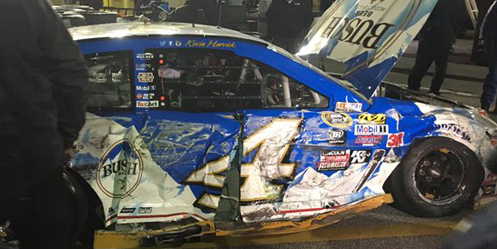 Newman began SpeedWeeks 2016 with a late-race crash in the Sprint Unlimited, leaving him 19th in a field of 25. He ran 18th-fastest in the opening Daytona 500 practice that day, ran 16th in the second session, and timed in 15th in qualifying at a speed of 194.099 mph. He missed the cut for the second round by just under four-hundredths of a second. On Wednesday, Newman was just 32nd-fastest of 36 entrants for the third practice session, but was preparing to make some race runs in the second session later that evening. In the last half of the session, he followed a single-file line of traffic off pit road and onto the track. Just as the line picked up speed, Ty Dillon’s #95 Cheerios Chevrolet fielded by Leavine Family / Circle Sport Racing cracked a weld in the oil cooler, leaking oil all over Turns 1 and 2. Newman, following Reed Sorenson’s #40 CRC Brakleen Chevrolet several carlengths behind, checked-up with the rest of the field, but slid in the oil. 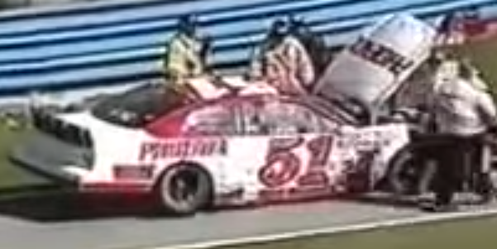 Newman bumped Sorenson and was hit by Michael Waltrip’s #83 Maxwell House Toyota, sending both of them into a spin. When the smoke settled, Newman was in the garage area, the Childress crew working hard to fashion a new right-front fender. Newman was one of the seven drivers who returned to the track on Thursday morning, running 5th-fastest of the group with the second-most laps turned. Satisfied, the Childress team prepared for Thursday night’s qualifier, where Newman was set to roll off 7th in Race 2. Starting last in Race 2 was Brian Vickers, whose relief duties for Tony Stewart in the #14 Bass Pro Shops / Mobil 1 Chevrolet began with a hard crash in the Sprint Unlimited and a technical infraction that wiped his qualifying time. He was joined in the rear by Martin Truex, Jr., whose #78 Bass Pro Shops / Tracker Boats Toyota was denied a qualifying attempt for an improper roof flap adjustment. Joining them were Kyle Larson and Michael Waltrip, both of them sent to backup cars in Wednesday’s wreck that damaged Newman’s machine. When the green flag flew, Larson fell to last going into the first corner, but Waltrip was last by the time the leaders came off Turn 4. Vickers took a turn in 22nd on Lap 2 followed on Lap 6 by Landon Cassill, making his first racing laps in Front Row Motorsports’ #38 Florida Lottery Ford. As three Joe Gibbs Racing teammates ran nose-to-tail ahead of a long single-file line, Cassill and the nine cars in front of him fell back into a distant second group, gapped by two seconds. Sorenson’s #40 fell to last on Lap 7 followed again by Cassill on Lap 10. By this point, Cassill, Sorenson, Waltrip, and Michael Annett had fallen back into a third pack even further back and were already in danger of eventually losing a lap. Then on Lap 30, Newman, still with the lead single-file pack, suddenly slowed on the track. He reported to his crew he had lost a cylinder, and the engine continued to sour as the rest of the field passed by. Coming off Turn 2 on Lap 31, Cassill passed Newman for last, and the #31 pulled into the garage soon after, done for the night. Newman, who races for a chartered team, will start 38th in Sunday’s Daytona 500. The remainder of the field finished under power, even as five of the leaders wrecked on the final lap. Finishing next-to-last was Sorenson, who lost a lap on track then three more in the closing stages. 20th went to Waltrip followed by Aric Almirola, who stayed out during green-flag stops to lead two laps in Richard Petty’s #43 Smithfield Ford. Rounding out the Bottom Five was Robert Richardson, Jr., whose #26 Stalk It Toyota secured the 40th and final starting spot in the 500 field based on his qualifying time. *This was Newman’s first last-place finish in the Can-Am Duels. *This was the first last-place finish for the #31 in a Duel race since 1994, when Ward Burton’s #31 Hardee’s Chevrolet was involved in a first-lap accident in Race 2. Just seconds after the green flag, Dale Jarrett lost an engine, causing the middle of the field to check-up. Buddy Baker clip Jeremy Mayfield’s car and the track closed up in front of Burton, who was one of the five cars eliminated in the wreck. *This is the Childress team’s first last-place finish in the Duel races since February 17, 1977, when Childress himself, then an owner-driver, lost the transmission on his #3 Kansas Jack Chevrolet after 1 lap of Race 1. On February 18, 2001, Jeff Purvis picked up the 2nd last-place finish of his NASCAR Winston Cup career in the Daytona 500 at the Daytona International Speedway when his #51 Phoenix Construction Ford was involved in a single-car crash after 47 of 200 laps. It was Purvis’ first last-place finish since October 5, 1992, when his #12 Raybestos Brakes Chevrolet lost an engine after 35 laps of the Tyson Holly Farms 400 at North Wilkesboro. It was also the first last-place finish for Phoenix Racing, the prolific single-car team owned by James Finch. A lesser-known storyline overshadowed by the untimely death of Dale Earnhardt was the return to Cup Series competition for both Tennessee driver Purvis and Floridian team owner James Finch. For Purvis, the 2001 Daytona 500 was his first Cup start since October 5, 1997, when he finished 39th in his fourth and final start for owner Larry Lockamy during the UAW-GM Quality 500 at Charlotte. For Finch, it was his first start as a Cup team owner since July 28, 1996, when Purvis last raced for him at Talladega and came home 40th in a field of 42. It was also the first time Purvis had raced for Finch since the XFINITY Series finale at Homestead in 1998, though by then the two had raced together for nearly a decade. Purvis’ XFINITY Series debut at Charlotte on October 7, 1989 came in Finch’s unsponsored #49 Buick - engine trouble left them 40th after just 21 laps. Following Purvis’ Cup debut with Bobby Allison at Martinsville the next spring, the two reunited at Dover that fall where Purvis finished 33rd. It was Finch who was to field cars for veteran Neil Bonnett during his return to Cup in 1994, but following Bonnett’s own death at Daytona, it was Purvis who raced in his honor. And two years later in 1996, Purvis scored Finch’s first two NASCAR victories in the XFINITY Series at Richmond and Michigan, coming home 7th in points. Bill Elliott closed his owner-driver operation after the 2000 season, making a number of his Ford Tauruses available for start-up teams. Finch acquired at least one of them and set his sights on making his first Daytona 500 as an owner since 1996. To make the race, he again tabbed Purvis to drive. 52 drivers showed up to make the 43-car field for the 2001 Daytona 500, including a sponsorless Ford that didn’t even have headlight decals on the nose. Finch had painted the former Elliott car flat white with a red roof with the number 51 on the door, making it resemble one of the cars he fielded and Purvis raced back in the 1990s. The car struggled to find speed in practice and qualifying, meaning that they would have to race their way into the 500 field. Purvis would start 25th in the 26-car field for Race 1. The Duel races run that Thursday were some of the most competitive on record as the popular restrictor-plate package from the previous years’ Talladega race made lead changes commonplace. Under the second caution of Race 1 with fifteen laps to go, Purvis and 1990 Daytona 500 winner Derrike Cope stayed out while the rest of the field pitted, putting the #51 up front for the restart. In those frantic final few laps, Purvis and Cope fell back into the three-wide pack. On the final lap, Purvis was in the high lane pushed by the unsponsored Eel River Racing #27 Pontiac of Kenny Wallace. Purvis and Wallace finished 8th and 11th, making the field. Rick Mast, his #50 Midwest Transit Chevrolet just a couple carlengths behind, joined Cope as one of the nine sent home. Purvis started 17th with Finch's Phoenix Construction company logos on the car and held his own during the opening laps of the Daytona 500. Despite the aggressive racing afforded by the new aero package, the first 48 laps were run under the green flag. Among the drivers who exchanged 43rd during that stretch were last-place starter Brett Bodine, Jeremy Mayfield, Johnny Benson, Jr., and Rusty Wallace, who lost a lap after a unscheduled Lap 28 stop and penalty for a flat tire. Wallace was still 43rd on Lap 49 when Purvis, running around 35th, lost a right-front tire in the high lane and made contact with the outside wall in Turn 4, drawing the first yellow of the day. 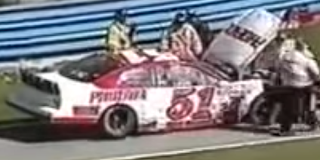 His car made it to the apron without involving anyone else, but the damage was too severe for the #51 to continue. Finishing 42nd that day was Dave Blaney, whose #93 Amoco Ultimate Dodge lost an engine just before the final quarter of the race. 41st went to rookie Kurt Busch, whose #97 Team Ford Racing / 2K Taurus Ford collided with Joe Nemechek in the trioval on Lap 158 and finished laps down to the leader. Bobby Labonte and John Andretti, who rounded out the Bottom Five, were among the nineteen cars gobbled up in the tremendous Lap 174 wreck on the backstretch. Just like Billy Standridge in 1998, Finch and Purvis pulled off the equally-impressive feat of qualifying for all four restrictor-plate races in the 2001 season, finishing a season-best 34th in the caution-free sprint race at Talladega. 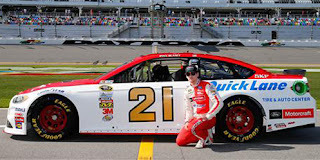 Purvis never raced for Finch in Cup after 2001, but what driver and team accomplished that year brought Phoenix Racing another twelve seasons in Cup competition, highlighted by Brad Keselowski’s thrilling win at Talladega in 2009. Finch sold Phoenix Racing to HScott Motorsports in 2013, but the team lives on today as the #15 currently raced by Clint Bowyer. *This was the first last-place finish for the #51 in a Cup Series race since May 28, 1989, when Butch Miller’s #51 Fruit of the Loom Chevrolet lost a wheel bearing after 24 laps of the Coca-Cola 600 at Charlotte. Despite the car number, Miller’s car was not a Phoenix Racing entry - it was owned by Leroy Throop. In the aftermath of the Race Team Alliance (RTA)’s new arrangement, LASTCAR.info is debuting this new segment for 2016 that will focus on the week-by-week performance of the Open (non-chartered) teams running in the Sprint Cup Series. To begin, we’ll look at the eight teams challenging for the final four spots in the Daytona 500. Despite being the only current Cup Series team to have raced throughout the sport’s entire six-plus decades, the Wood Brothers were not afforded a charter for 2016 and pulled out of the RTA soon after. Regardless, the team is full speed ahead on their effort to run their first full season since 2008 with returning young gun Ryan Blaney. As expected by many, Blaney was plenty fast enough to lock himself in as the fastest Open team. What remains to be seen is if the Woods can overcome the technical gremlins that left Blaney with four engine failures in 2015. 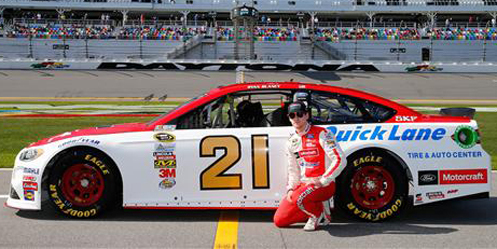 The technical alliance with Penske Racing and the new Ford Fusion should help performance, but without a charter, one struggle in practice followed by a rained-out qualifying session can still send the #21 home for future races. Matt DiBenedetto did a workmanlike job during his rookie season in 2015, rebounding from two early-season DNQs and finishing a season-best 18th at Talladega. This year, despite conceding his chartered #83 to Michael Waltrip for the season opener, DiBenedetto also locked himself in to his first 500 field on speed. Like Blaney, DiBenedetto and the BK Racing program are benefitting from a technical alliance of sorts, having inherited cars and several crew members from the now-defunct Michael Waltrip Racing. At least for the 500, the team has expanded from three cars to four with sponsorship on each. Anyone in BK’s foursome could be a dark horse in the 500 itself - last year, Johnny Sauter was 13th-fastest in time trials, was sent to a backup car, and still finished 19th. As news of the charter program swirled during the offseason, a number of teams merged, likely to better ensure their chances of making those final four spots. The biggest merger occurred between Leavine Family Racing, which has fielded the #95 part-time since 2011, and Circle Sport, owned by longtime team owner Joe Falk. Helped by a technical alliance with Richard Childress Racing, Falk’s #33 ran full-time by 2013 and grew to two teams with crew chief Mike Hillman’s #40 later that season. However, for 2016, the decision was made for the #33 to merge with Leavine’s #95, bringing the Childress alliance with him for a full-season run. Like BK Racing, the team’s chartered primary car will not have its regular driver behind the wheel - Childress’ Ty Dillon will run the #95 with sponsorship from Cheerios. However, for the first time, the Leavine program will field two cars. 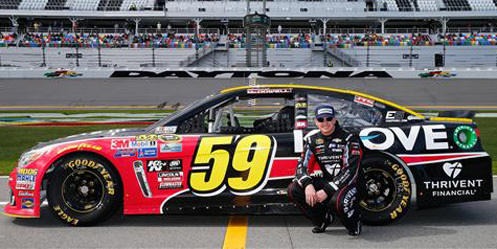 Michael McDowell, who joined Leavine in 2014, may have to race his way into his fifth Daytona 500 driving the Open team car #59. He is the first of two drivers on the bubble, meaning that he could be locked-in depending on who finishes best among the Open teams. Joining McDowell among the bubble drivers is Robert Richardson, Jr., driving the #26 run last year by rookie of the year candidate Jeb Burton. In eight previous Cup starts - all of them at Daytona and Talladega - Richardson has finished no better than 18th in his series debut and has not raced in Cup since Talladega in the fall of 2012. Although the driver and team arrangement came together less than a week before qualifying, Richardson now has a decent shot at making the 500 field, though he will start Duel Race 2 directly in front of two of his challengers. After several mergers and reorganizations over the past five years, Premium Motorsports earned themselves a charter spot by acquiring Phil Parsons Racing, whose #98 was an RTA member. However, team owner Jay Robinson has since leased the #98’s charter to HScott Motorsports to secure driver Michael Annett and the #46 a spot in the race, and without enough speed in qualifying, the team is now one of the four who must race their way into the 500 field. Behind the wheel will be third-year driver Cole Whitt, 31st in driver points last year when he drove for Front Row Motorsports. Whitt could turn heads on the plate track - he started 19th and finished 22nd in the 2015 Daytona 500 and went on to finish a season-best 13th at Talladega. Like the Wood Brothers, however, Premium needs to get a hold of their mechanical issues. Last year, a broken axle and an oil leak made them miss the start at Indianapolis and Michigan, and as a Parsons car, an pre-race ignition issue kept them out of the 500 field. If all goes well, however, Premium plans to add the #49, a second team car later this season, with the driver to be announced. Whitt’s former ride, the #35, wasn’t originally set to run in 2016 as the team’s chartered #34 and #38 were locked-in with defending XFINITY Series champion Chris Bueshcer and defending LASTCAR Cup champion Landon Cassill driving each. However, Gilliland, the former driver of the #38, will return to the site of his 2007 pole position driving a yet-unsponsored #35 that must now race its way into the field. In 330 previous starts, the California driver has historically surprised at both the plate tracks and road courses, and will need to recapture that magic on Thursday night. Perhaps the ultimate underdog in Thursday’s field is The Motorsports Group (TMG), Curtis Key’s single-car team that struggled tremendously to transition from the XFINITY Series to a part-time Cup runner in 2015. TMG made just two starts in fifteen attempts last year, finishing 42nd with Ron Hornaday, Jr. at Atlanta and a season-best 40th with Jeff Green at Richmond. As of this writing, the team is also without sponsorship, and they were not able to find enough speed to lock themselves into the show. What the team does have, however, is journeyman Josh Wise, who in 2014 gave Phil Parsons Racing its best-ever season after five long years of “start-and-parking.” That year began with Wise finishing an impressive 5th in Duel Race 1 and ended with a 36th-place finish in driver points with just one DNQ. If TMG is to make its first 500 appearance, Wise might be the best man for the job. Initial reports over the offseason indicated that Hillman Racing, the single-car team Landon Cassill raced into the last two Daytona 500s, had been absorbed into Premium Motorsports. However, just a few days ago, Mike Hillman announced that his #40 would again enter the 500. Dismayed after being denied a charter, Hillman reported he plans to attempt at least a partial season in 2016 and has welcomed back returning sponsor CRC Chemicals for the Daytona effort. Like TMG, Hillman has selected another veteran journeyman driver in Reed Sorenson, a six-time 500 starter who finished 5th in 2008 and 9th in 2009. Last year, it was Sorenson who penned the feel-good story of the week when Xxxtreme Motorsports rebounded from a qualifying crash and gave Sorenson a backup #44 Chevrolet he raced into the field. Sorenson may have an even better ride in 2016, as Hillman’s cars have excelled at the plate tracks - most notably a 4th by Cassill at Talladega in 2014. On February 13, 2000, John Andretti finished last in the Bud Shootout at Daytona when his #43 STP / Cheerios Pontiac was disallowed from competing in the 25-lap event. Andretti was competing in his eighth season on the NASCAR Winston Cup tour and was coming off what was to be his second and final Cup victory at Martinsville the previous spring. Andretti’s other victory took place at the Daytona track in 1997, when he drove for Cale Yarborough Motorsports in the #98 RCA Ford. 2000 was a significant year for the Petty Enterprises team. 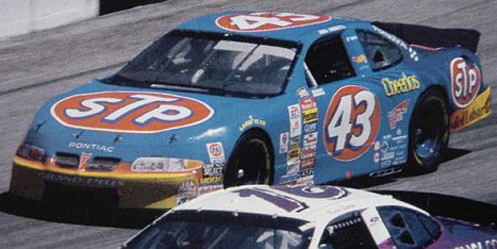 STP, which had been the primary sponsor of the iconic #43 since 1972, was scaling back its funding to an associate sponsor by the end of the year. General Mills and its Cheerios brand would assume a progressively greater presence on the #43 through the season, culminating with Cheerios on the hood when the series returned to Daytona in July. While one tradition was ending, another endured, locking-up the last spot in the field before the race even started. While Andretti won a pole at Phoenix the previous fall, a family agreement not to run the Bud Pole Award decals on the car left them ineligible to run the Shootout itself. Due to the team essentially disallowing themselves, Andretti is classified last in the official standings, and is thus for purposes of this site credited with finishing there. Starting in the rear of the now 15-car Shootout field was Dale Jarrett, fresh off his first Winston Cup championship for Robert Yates in the #88 Quality Care / Ford Credit Ford. Jarrett didn’t win a pole during his title season, so he had to earn the 15th spot in the main event by winning the Bud Shootout Last Chance Qualifier run earlier that day. Jarrett started 6th in the event, dodged a multi-car wreck when Kenny Wallace and Jimmy Spencer tangled off Turn 4, and prevailed on the mandatory green-flag pit stop to win by more than four seconds over Jeff Burton. It was to be the last of three runnings of the 25-lap qualifying race. Nineteen drivers were to make the starting field, but eight withdrew prior to the start, including Derrike Cope, who decided to focus on second-round Daytona 500 qualifying in what was to be the final 500 start for Hall of Fame team owner Bud Moore. When the green flag flew for the main event, Jarrett leap-frogged Kenny Irwin, Jr.’s #42 BellSouth Chevrolet by the end of the backstretch and began his march through the field. Irwin was then passed for last by David Green the next time into Turn 1, Green running a one-off start for Kurt Roehrig in a #34 Chevrolet sponsored by Sunoco Lubricant and Kendall Motor Oil. On Lap 4, Jarrett once again fell to the rear as the field remained two and three wide near the back of the pack behind then-race leader Jeff Gordon. Jarrett passed Green to put the #34 last again on Lap 6 as the field remained within a one-second interval from front to rear. With pit stops coming up, Green and Jarrett continued to trade last on Lap 8 with the leaders locked two-by-two. All but two cars - Jarrett and the #18 Interstate Batteries Pontiac of Bobby Labonte - came down pit road on Lap 9. That time by, Mark Martin was about to come into his stall, but seemed to misjudge the entry, leaving the right side tires outside the box. In the process, he clipped his front tire changer Mike Garrett with the nose of his car, launching Garrett onto the hood. Garrett injured his ankle in the incident, but was otherwise conscious when interviewed shortly after. Without a completed pit stop, Martin pulled his car behind the wall, leaving him last among the starters in the race. Moments after Martin’s incident, engine woes forced Mike Skinner to park his #31 Lowe’s Chevrolet for Richard Childress Racing, leaving thirteen cars to settle it on the track. Ricky Rudd finished 13th when his first turn in Yates’ #28 Texaco / Havoline Ford ended with a wreck out of the Top 5 following contact between Bobby Labonte and Sterling Marlin off the final corner. Rounding out the Bottom Five was David Green, whose #34 lost the lead draft after the mandatory pit stops. Andretti has made a total of 393 starts in what is now the NASCAR Sprint Cup Series. His most recent start was the 2010 Daytona 500, where he drove Front Row Motorsports’ #34 Window World Cares Ford into the 33rd starting spot before a crash left him 38th. He has eleven last-place finishes in Cup points races, tying him with several drivers including 1986 Daytona 500 champ Geoffrey Bodine for the 14th-most in series history. *This was Andretti's second last-place finish in this event. He previously finished three laps down in 1996 Busch Clash when driving the #37 K-Mart / Little Caesar's Ford owned by Michael Kranefuss. *Andretti wasn’t the only Petty Enterprises driver to finish last in the Bud Shootout because of the pole award arrangement. Bobby Hamilton did in 1998 followed by Jeff Green in 2004. Today, the Race Team Alliance (RTA) finally announced their brand-new charter system to be instituted in the 2016 Sprint Cup Series. 36 teams have been afforded “medallions” earning them guaranteed spots in the field - so long as they remain in “good standing,” attempt every race, and follow other yet-undisclosed requirements. Last year at Homestead was the final 43-car field in NASCAR as we’re also going to see just 40 cars cross the line in the Daytona 500, the final four of which left open for teams without medallions. We haven’t always had 43-car fields. In fact, before 1998, every Sprint Cup field was a different size according to track length. This isn’t the first time field sizes have been cut, either - the XFINITY Series went from 43 to 40 in 2013 and the Trucks from 36 to 32 just last year. But what’s just happened in the Cup Series is very different - by reducing field sizes by three and also instituting a medallion system, the RTA has created not just a floor, but a ceiling. And in so doing, they’ve damaged an integral part of the sport. Up until this year, whether or not you could compete in Sprint Cup was determined largely by two things: qualifying speed and your team’s rank in owner points. It was a simple meritocracy: if your team wasn’t performing or just wasn’t fast enough, you weren’t going to finish very well if you made the show at all. If you continued to struggle for too long and couldn’t receive financial support, the numbers alone would close your team. For some teams within the RTA, this scenario is very much a reality. Tommy Baldwin Racing, which this year fields the No. 7 Chevrolet for Regan Smith, last year scaled back from two cars to just one, having spent five years trying to expand. Leavine Family Racing’s No. 95 will run full-time for the first time in 2016, but only because they were able to merge with Circle Sport and receive support from Richard Childress. Premium Motorsports, which will field up to two cars in 2016 and lease its medallion to HScott Motorsports, contains the remnants of eight different Sprint Cup teams from 2012. But this scenario is not the same for Hendrick Motorsports, Penske Racing, Joe Gibbs Racing, and the like, which have gobbled up the majority of the 36 medallions. There has never been a danger that Dale Earnhardt, Jr. would miss a race, or that Matt Kenseth wouldn’t find sponsorship to replace The Home Depot. But that’s the fallacy the RTA built the charter proposal - and the need for it - upon. The multi-car programs insist that they really have been in danger, that the value of their teams isn’t enough to keep the lights on. Yet still, through this charter agreement, they’ve granted themselves added privileges they never needed in the first place to secure spots they were never in danger of losing. But that’s not all. Through the “good standing” requirement, RTA teams can oust people from the group of 36. The initial interpretation of this rule was to eliminate “start-and-parks,” again falling into the myth that teams do so as some kind of scam and not to survive and build their programs. But the rule is much broader than that - if a team simply isn’t finishing well on a consistent basis, their charter can be rescinded. This is a big problem because there haven’t been any “start-and-park” teams in Sprint Cup for the last two seasons, meaning that any Cup team can finish last in today’s NASCAR. Racing is an unpredictable sport, and a streak of bad luck isn’t unheard of. Thus, it’s very likely that the Baldwin, Leavine, and Premium cars to name a few can be kicked out very early on by the program that was supposed to protect them. 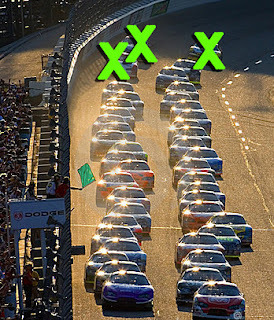 Defenders of the charter system are quick to point to those final four spots in the 40-car field, saying that teams without a medallions aren’t prevented from qualifying or competing. The first problem with this is obvious - there used to be 43-car fields, and now there’s three fewer chances of qualifying than before. The second will come into play when teams start to fall out of the chartered 36. The few teams already without a medallion will have an even harder time trying to qualify as they’ll have to compete against a growing number of ejected teams. The third is due to the inflexibility of the barrier between drivers with and without medallions. A medallion may be purchased or loaned, but the cost is based on demand with no oversight, meaning that even if the applying team can afford the fee on top of cars, equipment, tires, etc., the locked-in teams can still pick and choose which of the applying teams they feel like welcoming. Then, when combined with the equally-nebulous “good standing” rule, that same team can have its medallion revoked again for not finishing well enough, requiring them to pay the fee all over again. It’s a brutal business model much more perverse than the one already in place, allowing the big teams to watch the small ones fight each other to the death. This scrum for the final few starting spots in the field also creates a logjam that will prevent any new start-up teams from breaking into the sport for years to come. As I stated in my opinion piece last month, it is the Top 35 Rule Version 2.0, re-branded to sound less offensive. NASCAR has no shortage of drivers trying to break into Sprint Cup - the problem has for years now been a lack of teams. Just nine years ago, 61 cars arrived to attempt the 2007 Daytona 500, creating two Duel races with 31 and 30 cars. Big names and teams were sent home from this and several other races that season, many because they were brand-new and didn’t have any points to fall back on. With every DNQ, the hole just went deeper and it was impossible to break into the Top 35. The medallion system makes this impossible task a hard-and-fast rule, adding arbitrary costs and performance requirements to make it that much more difficult. And it’s doing it at a time where both drivers and the sport need to welcome more new teams into the fold. In short, it’s counterproductive to the growth of the sport. It’s already hard to make it into a Sprint Cup race. Simply getting a car to the track and taking one qualifying lap requires the work of many staff and crew members, both seen and unseen. To earn a good finish, to get to the next race, much less the whole season - these are accomplishments in and of themselves. But the RTA doesn’t care about any of this. They turned a meritocracy into a common entitlement program. In exchange for a little added security for its richest members, those clutching medallions have slammed shut a door though which every single one of them have passed, saying “forget you, I’ve got mine.” They have shoved the sport one more step away from the guy who soaped numbers on his Lincoln at the Charlotte Fairgrounds in 1949, making the culture in the garage area a little more bland, a little more predictable. And with every medallion fee they collect, they are selling the soul of NASCAR racing.